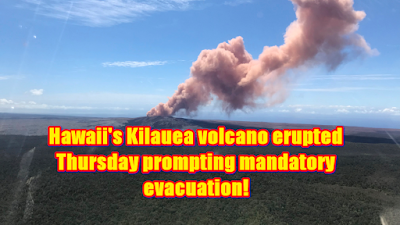 Hawaii's Kilauea volcano erupted Thursday prompting mandatory evacuation! 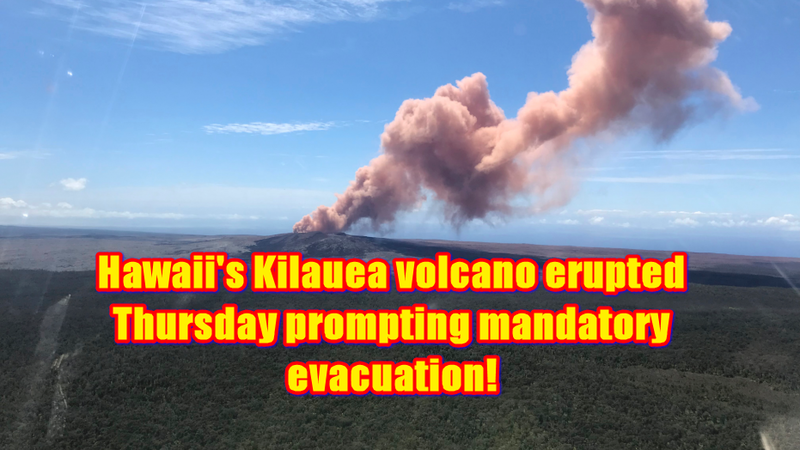 HONOLULU – Hawaii's Kilauea volcano erupted Thursday, sending lava shooting into the air in a residential neighborhood and prompting mandatory evacuation orders for nearby homes. Footage shown on local television showed lava spurting into the sky from a crack in a road. Aerial drone footage showed a line of lava snaking through a forest. Resident Jeremiah Osuna captured drone footage of the lava burning through the trees, a scene he described as a "curtain of fire." "It sounded like if you were to put a bunch of rocks into a dryer and turn it on as high as you could. You could just smell sulfur and burning trees and underbrush and stuff," he told Honolulu television station KHON. Lava fountains were shooting 150 feet (46 meters) in the air, and molten lava spread out over an area about 200 yards (183 meters) wide behind one house in Leilani Estates, Big Island resident Ikaika Marzo told the Honolulu Star-Advertiser. Officials said there is no way to predict how long the eruption will continue. Asta Miklius, a geophysicist with the U.S. Geological Survey Hawaiian Volcanoes Observatory, told The Associated Press that there is quite a bit of magma in the volcano's system. "It won't be just an hours-long eruption probably, but how long it will last will depend on whether the summit magma reservoir gets involved," she said. The county has ordered evacuations for all of Leilani Estates, which according to the 2010 U.S. Census has a population of 1,500. Hawaii Gov. David Ige also mobilized the Hawaii National Guard to assist with evacuations and security. Ige also signed an emergency proclamation providing state money for response efforts. There are about 770 structures in the subdivision where lava is flowing. Ranson Yoneda, the recreation director for a Pahoa community center, was readying the gymnasium for evacuees after it was selected as a Red Cross evacuation center. The U.S. Geological Survey said new ground cracks were reported Thursday afternoon. Hot vapor emerged from a crack and spattering lava began to erupt. Puu Oo's 1983 eruption resulted in lava fountains soaring over 1,500 feet (457 meters) high. In the decades since, the lava flow has buried dozens of square miles of land and destroyed many homes.